Stylishly decorated with French provincial inspiration, our two bedroom cottage offers guests quality accommodation and value for money. Just 500m walk to the main street of Bright where you can enjoy the many local Cafe's, restaurants and shops. The cottage is set amongst landscaped gardens and we pride ourselves on the cleanliness and presentation of our cottage. 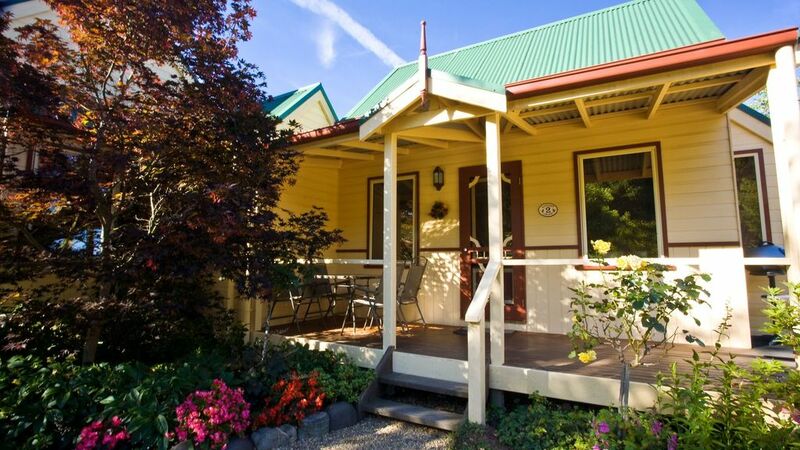 The perfect location for a relaxing break and to soak up the picturesque surrounds of beautiful Bright. Lovely cottage. A 5 - 10 minute walk to the town centre, or you can get on the rail trail right next to the front door. Thanks for sharing your feedback Brittany and you enjoyed the cottage and its close proximity to shops and the rail trail. We look forward to welcoming you back. The owners of this charming property did their very best to help us through the booking and payment process. We arrived to find the heater on and the property immaculately clean. The storage in each bedroom was more than adequate, and great to find plenty of hangers in the wardrobe. The kitchen was similarly well equipped, and the unusual two ring cooker served us well. comfortable seating, and more than comfortable beds. The property is very well located - off the main road, so very quiet, and a lovely walk along the rail track just round the corner, with a ten minute walk to the heart of this beautiful town. The ambience of the whole property is charming, welcoming and warm, backed up by caring though unobtrusive support from the owners. A relaxing and memorable experience. Thanks so much for the positive feedback, and importantly letting us know what it was you enjoyed about your stay. We look forward to welcoming you back. We absolutely loved our stay at this property. The cottage seems to be brand new and is beautifully decorated and furnished with a French flavour. The beds are soooo comfortable and the heaters and the aircon mean it will be perfect in any season. This was a perfect spot for us, even with an 18month old. Very clean and well appointed (eg. having glad wrap to use makes things so easy!). Lovely and warm, with great access to town on foot. Thank you to Gil and Lars for making it all so easy. We went on a very hot weekend 40+ and were able to wander into Bright to the market and shops. Then come home and relax watching DVD in air-condition comfort. It was a very comfy sanctuary. Unit comfortable, quiet, welcoming, clean, walking distance to town - just lovely.